4/18/19 - Irrigation water will be turned on April 19, 2019. Please make sure that your valve is closed in order to make this process run smoothly as well as to prevent damage. If you have any questions or concerns contact HPM at elizabeth@hpmgj.com or 970-243-3186. Thanks! 10/22/18 - The Annual Meeting was held December 19th. Meeting Minutes posted below. 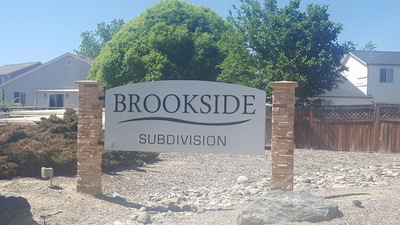 04/25/18--Brookside owners can water between the following times: 4 pm - 12 am and 6 am - 10 am. The common areas are watered between 12 am and 6 am, please do not water at these times. In the interest of keeping Brookside homeowners/residents informed of what your Board is doing, we are implementing this posting. First of all, your Board will do whaterver they can to improve thei subdivison and will consider all homeowner suggestions, Please keep in mind, however, that suggestions that conflict with the CC&Rs or established Rules & Regulations [R&R], will not be implemented. CC&Rs and R&R are posted elsewhere on this website. Please make sure that your tenants are aware of the following. 1. Trash cans in view from the roads. The CC&Rs and R&R both state that garbage cans must be stored out of sight exept on trash pick-up day. They must be placed BEHIND fences, INSIDE garages, or somewhere out of view. It is also city ordinance that containers not be left on the sidewalk after pick-up day. 2. Derelict vehicles within the neighborhood. The short answer is a vehicle is derelict if it is in plain view from the street and without current plates and registration visible. Again, the CC&Rs and R&R state that inoperable, unlicensed, and unused vehicles must be stored in your garage, behind a privacy fence, or removed from the subdivision. Additionally, derelict/inoperable vehicles are also addressed in the GJ City Ordinances. According to the city ordinance, inoperable vehicles are considered 'outdoor storage' and must be screened from view. 3. Vehicle repair being done in driveways. The CC&Rs allow ordinary maintenance and minor repairs of your own vehicle to be done in the driveway. (this would be things such as oil changes, washing and waxing, etc) Major repairs or restoration must be done inside the garage or behind the fence. 4. Portable basketball hoops. These are not allowed to remain on the streets or the sidewalks when not in use; they must be moved back onto your private lot! Violations can be reported to Grand Junction Code Enforcement. 5. Snow removal. Snow must be removed within 24 hours after snow stops and there is more than 2" accumulation. The city of Grand Junction can assess fines if public sidewalks are not cleared according to those guidelines. The HOA will remove snow from the sidewalks around the park/common area and the mailbox areas. Homeowners/residents are responsible for removing snow from the sidewalks in front of their homes, from their individual driveways and their private walks. REMINDER: Please remember that Colorado law prohibits parking your vehicle within 15' of a FIRE HYDRANT!!! It has been reported that many residents/visitors to Brookside are violating this. The police/sheriff will be called and tickets will be issued. All questions should be directed to info@hpmgj.com. We are excited to work with you and assist you in the support of your HOA. Please let us know how we may serve your needs!